Well the season to be jolly is almost upon us and for certain it is my favourite time of the year! Christmas always evokes great memories of years gone by. The huge queue to see Santa at Clery’s that used to wind the whole way around the shop, Switzer’s window which always involved what seemed to be an exotic trip over the ha’penny bridge to the south-side and the inevitable trip into the Pro Cathedral to admire the crib. Those days are gone now and it’s my turn to create memories for my own brood who hopefully in turn will do the same for theirs. 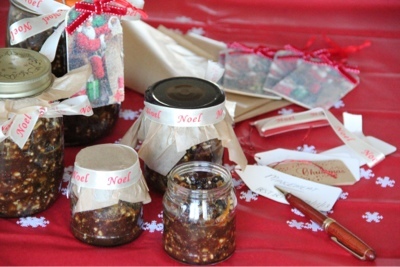 I purchased Rachel Allen’s latest book recently and I came across this recipe for mincemeat. I adore the stuff, I have even been known to spread it on toast! I hope I can wait the two weeks it takes to mature before indulging. Anyway what better way to kick off the memory making season than knocking up a batch of this? Place the chunks of apple in a saucepan with a teaspoon of water. Cover with a lid and cook over a low heat until soft. Set aside to cool. Put all the remaining ingredients in a large bowl and mix with the apple. Pour into sterilised jars and leave to mature in a dark place for two weeks. Stored this way the mincemeat should be perfect for at least a year. One Response to Homemade mincemeat!